Kierkegaard Lives: California Postpones Execution For Lack of Doctor Participation. California Postpones Execution For Lack of Doctor Participation. Morales, along with cousin and co-defendant Rick Ortega, raped Winchell and beat her to death in retaliation for her having a romantic relationship with Ortega’s lover. The crime occurred in San Joaquin County, but the trial was held in Ventura County due to the amount of pre-trial coverage. Morales was 21 years old at the time of the crime. 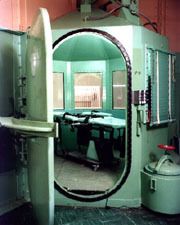 Morales argued that the chemical cocktail to be used in his lethal injection violates the Eighth Amendment prohibition against cruel and unusual punishment. Morales argued that the drugs could cause the prisoner to suffer excrutiating pain from the last two chemicals if he were not fully sedated. Last week, U.S. District Judge Jeremy Fogel ruled that California had to change the drugs it uses when executing prisoners, or skip the usual drugs used in California and instead execute Morales with a lethal overdose of a sedative. On February 19, the Ninth Circuit instead approved the presence of anesthesiologists at the exectuion to ensure that Morales would be unconscious during the execution. [the]anesthesiologists who were going to be present objected that they might have to advise the executioner if the inmate woke up or appeared to suffer pain. "Any such intervention would clearly be medically unethical," the doctors, whose identities were not released, said in a statement. "As a result, we have withdrawn from participation in this current process." California initially intended to go forward with the second option allowed by Fogel's order, executing Morales with a lethal overdose of a sedative instead of the usual chemical cocktail. Fogel's order, however, "said the sedative must be administered in the execution chamber by a person who is licensed by the state to inject medications intravenously. That group would include doctors, nurses and other medical technicians." California was unable to find a doctor, nurse, or other person licensed to inject the lethal dose of barbiturate. As a result, California was unable to proceed with the execution yesterday. Morales's death warrant expired at 11:59 p.m. yesterday. Now, California must go back to the trial court for a new death warrant. According to the AP story, "[i]t was unclear when the execution would be carried out, but the delay could last for months because of legal questions surrounding California's method of lethal injection." How Appealing (February 23, 2006) -- links to lots of commentary about impact of this case on nationwide use of lethal injection. CNN.com (February 23, 2006) -- story about how the victim's family is dealing with the delay. CNN.com (February 23, 2006) -- AP story about delay amounting to moratorium on execution in California. Sentencing Law & Policy (February 23, 2006) -- compilation of headlines, editorials, and commentary about the Morales case. More on California's next move in the death penalty case involving Michael Morales. Partial Birth Abortion Ban to SCOTUS. An E-Bay Ad You Don't Want to Miss. Update: Foster Parents Who "Caged" Children. No More Hopscotch in Lincoln, Nebraska. The Friday Fantastic Four #5.